We are nearing the release of Collaborative Lifecycle Management (CLM) 6.0 that will include Configuration Management (CfgM) across lifecycle projects, which we developed using IBM Design principles. One of these principles in our design thinking is the use of release hills to expresses user value, objectives and the scope of the release. Our first hill for the 6.0 CfgM capabilities is to ensure that, ‘with minimal impact to current usage, team members can select a configuration related to their plan and be confident that they are using the right artefacts and links’. To meet this objective we designed a simple, usable and transparent user experience for practitioners to select, work and navigate in a configuration context. Our second release hill is to ‘define configurations of a product under development consisting of requirements, tests, designs and implementation’. For this objective we designed configuration management administration in a new global configurations application. User scenarios are a key part in our design process. In the scenarios for the first release hill we focus on how personas, like Susan a system engineer or Tony a tester, are using work item links to browse to artifacts in the right configuration context. For example, when following a link that Tony created in a defect, Susan would browse into the release baseline context to reproduce the defect. Or for change requests, Susan would browse into a development stream to update the linked artifacts. In both cases we pursued a design that simply switches the practitioner into the right configuration context. In the CLM 6.0 release we designed a simple and transparent configuration selection and navigation mechanism for these scenarios. It’s based on the assumption that administrators or project leads will create ‘releases’ associated with project timeline iterations and global configurations in the work item system. Some ‘releases’ will represent immutable release baselines. Other releases will represent streams for new development. As project leads, self configuring teams or practitioners start assigning work to plans. The ‘Planned For’ and ‘Found In’ fields in the work items will be set and associated to such a ‘release’. When a practitioner follows a link to the target artifact, the right configuration and artifact version will be opened. The configuration is also used when hovering over a link to get a preview of the link target artifact. With this design, teams can easily adopt new configuration management practices with very low impact to users. An alternate use-case for selecting a configuration is to use the Configuration Management menu on the application banner. By clicking the ‘Switch’ button a practitioner can browse and select a new configuration context. 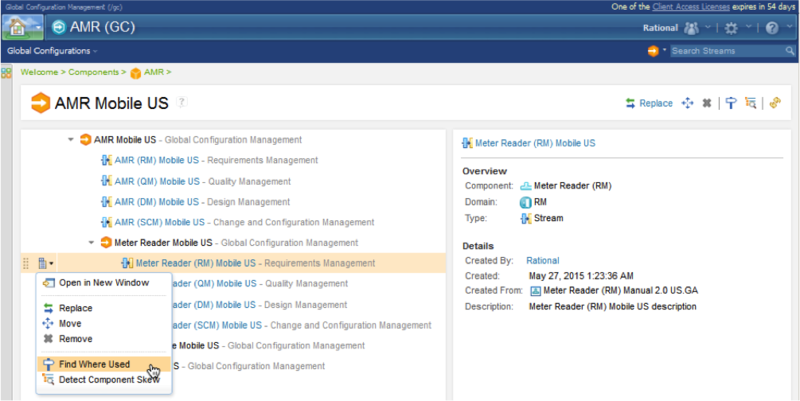 This simple design provides a consistent experience across the CLM 6.0 tools for requirements, tests or design. 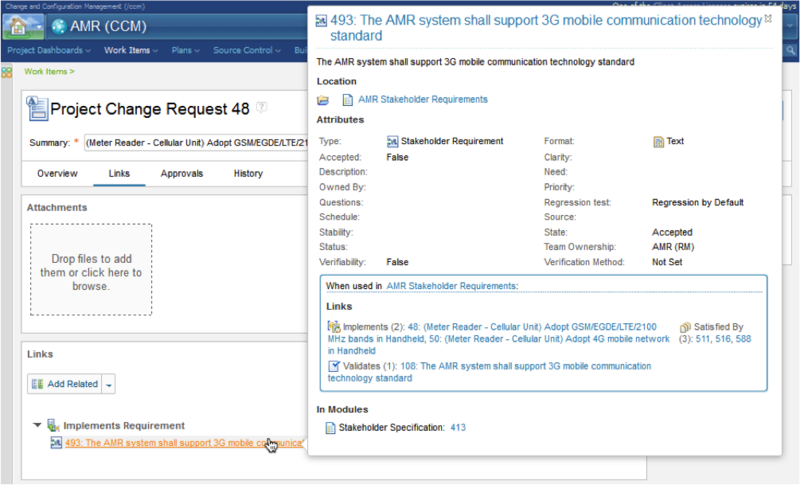 The configuration context information on the application banner, found on the left side of the menu, gives practitioners a simple and accessible way to see and confirm the current configuration context. Also, the configuration management menu is designed to provide basic and advanced actions for managing configurations and change, including creating streams and baselines, managing changes by comparing configurations and delivering changes across configurations. The scenarios and design for configuration leads and administrators has taken aim at a much richer configuration management user experience in the new Global Configurations application. Here administrators can create Global Configuration project areas that define global components with stream and baselines that provide consistent configuration management across requirements, tests, design and implementation. Global configurations also provide key capabilities to manage products, product variants and reuse. The design of the Global Configurations tool provides a hierarchal editor for global configurations with consistent new flat and clean icons and easy to find context actions which are also easy to use. While the user experience is rich in configuration management administration capabilities, we also designed the tool to be easy to find and use for experienced practitioners that may need richer configuration management capabilities than provided by the tool configuration management menu. The design of the configuration management menu provides easy navigation directly to the Global Configuration editor for the current global configuration context by just clicking on the Global Configuration link in the menu. You can note this in the second image above this text. The design of the Global Configurations tool provides great design consistency and usability. Project Area Configurations are picked and updated using consistent dialogs. The usability of the tool is improved through link navigation from the editor directly to the Project Area configuration in the context of the selected global configuration. If you would like to see these new capabilities in action right away, you can give them a test run in the Jazz.net cloud trial area.